Clearly, artists and their agents recognize the inherent potential of promotional collaboration, and advertising's fascination with art, coincides with a decrease in public funding for artists, public galleries and museums. In a deregulated economy we are all increasingly reliant on sponsorship, donations, and gifts, although of course nothing is free. All exchange opens a contractual space of indebtedness, donors expect something in return. Marketing has been extending its interests through our ‘artworlds’ for some time. What's new is the acceleration in the speed of the convergence of our interests; product advertising and artworks, restaurants and galleries, studios and shops, fashion features and artists lifestyles, loop back into each other through an endless vertigo of mutual benefit. By borrowing the logic of Habitat’s popular ARTCLUB scheme, and coupling this to the desire of the new Centre for Visual Arts to establish an international reputation for itself, PROMOTION attempts to short the circuit. The combined promotional machines of both institutions, will be momentarily turned on six young emerging artists. The difference being, all the invited artists for this local ARTCLUB commission, are already part-time employees in Habitat’s flagship store in Cardiff. For a limited period, you can participate in PROMOTION by buying a limited edition print, each print is from an edition of twenty; hand printed on acid free handmade paper using water soluble inks, 70 x100 cm. Purchase is limited to one per person, and subject to availability at £49.99 unframed. Opening in September this year, the Centre for Visual Arts will be Wales's largest venue for changing exhibitions of new and historical art; in the heart of the fastest growing city center in Europe. The CVA is funded by public and private benefaction, its running cost are expected to be met by gifts, grants and sponsorship, augmented by ticket sales. Since the 1960’s Habitat has worked with contemporary artists, from David Hockney and Edwardo Paolozzi to Gary Hume and Tracy Emin. Habitat’s innovative ARTCLUB scheme -see in store for details- offers special invitation and entrance to selected exhibitions, discount on commissioned ‘limited edition prints’, an artists designed club-card and a quarterly listings magazine. Helen Thornton works in a broad range of print and digital media. Helen’s ‘texts’ appear in a variety of guises, from newspaper features, press releases, advertising copy, e-mail newsgroups, and web -sites. They share a desire to fold the readers expectations back upon themselves, while playing subtly with the conventions of communication. Cheryl Hudgell is one of the most exciting young artists working in Wales. Cheryl has already exhibited widely, her multi-media installations, although diverse, are linked by a fascination with ‘the body’ as natural resource, and site of intense commodification. Russell Bulimore epitomizes a younger generation of artists who are fluid in their interests; he moves easily between the previously distinct specialisms of art, design and architecture. Russell’s beautiful print for Habitat uses the most economical of means, the simplest of gestures, to seductive effect. As a designer Yvonne Russill has worked with the most high profile of agencies, founding her own successful consultancy in 1993. Yvonne ‘s print collects the delicately traces of a busy international career, meshing with a more reflective, fleeting interior life. Justin Carroll is a skilled and successful jeweller, potter, engineer, sculptor and restorer. Justin’s bold but elegant Japanese woodblock-inspired print, captures his love of his native countryside. Although any romance is tempered by an awareness of the corrosive effects of consumerism, and mischievous humour. Bethan Price has recently been engaged on a number of high profile private commissions. Using the most prosaic of materials -processed through the latest software- Bethan is able to conjure images of startling refinement. Her print for Promotion deploys delicate washes of colour in a digital parody of lyrical abstraction . Mark Diggins is fascinated by the iconography of medieval architecture. Mark’s interests circle the emergence of a ‘new nostalgia’ which perfectly reflects a wider millennial angst. The pop charm of his luscious print for Promotion, oozes a darker Gothic dread. Elizabeth Martch is promoted by the crafts council, trained as a ceramicist, Elizabeth already has a growing international reputation. Her work is rooted in a profound respect for the natural environment. The startling print Elizabeth produced for Promotion, fuses a love of nature with an awareness of the finest traditions of the media. Neil Cummings would like to thank for their support Catherine Baum, the participating artists, Jeremy Youngs at John Purcell Paper, Wigmore Fine Art, Paul Neale at GTF, Pete Williams at Print market Workshop, David Barrett and Louise Mills at Habitat. 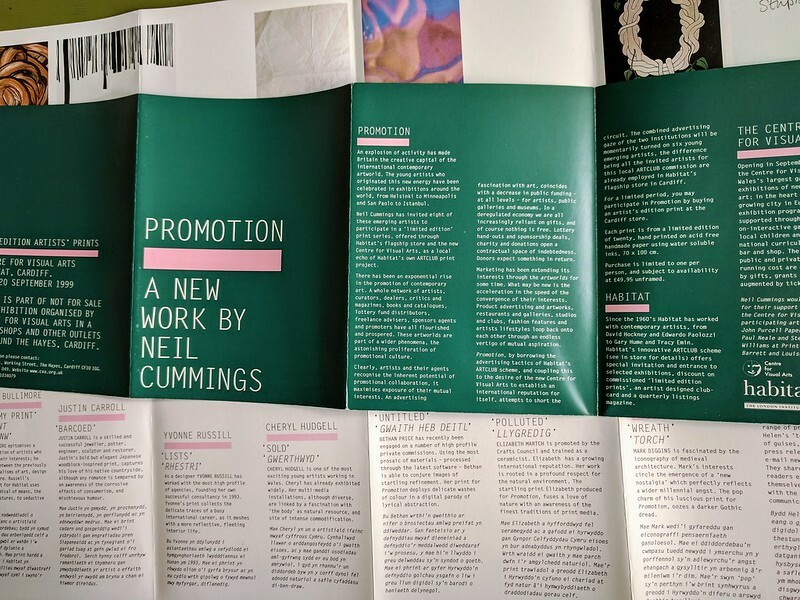 PROMOTION engaged with the complex aspirations of both institutions, the CVA and Habitat, and with the irony that local artists feel precarious and undervalued, although essential as employees and vital to the art ecology.